There is nothing unorthodox, however, about the approach the 19-year-old netminder has taken in pursuit of his lifelong dream. Kovar (pronounced KOH-vash) left his homeland this past summer to continue his development at the major junior level in the Canadian Hockey League. This is the path that many European prospects are now taking, due in large part to the transfer agreement rules, which give NHL teams only two years to sign drafted players from most countries before losing their rights. Up until a few years ago, teams could hang onto the rights of international players indefinitely. Kovar was selected by the Flyers in the fourth round (109th overall) of the 2006 NHL Entry Draft. Technically, the team has until the day prior to the 2008 version of the event to agree to terms with him, or he would be eligible to go back into the draft. Prior to his arrival in North America, Kovar was acknowledged as one of the top junior goaltenders in the Czech Republic. He has now represented his country at the past two World Junior Championships, and is in the midst of a solid debut season in the Ontario Hockey League. Kovar began the campaign with the Oshawa Generals, but was recently one of the focal points in a major deal with the Windsor Spitfires. He has played well thus far for his new team, which is counting on him to bolster its playoff hopes down the stretch. Kovar was born on July 19, 1988 in Pisek, a quaint town with a population of roughly 30,000, located in the Czech Republic's South Bohemian Region. Pisek is considered to be one of the more historical areas in Central Europe. “It is a very interesting place,” said Kovar. “It is a small town, compared to the bigger cities in Czech Republic. There is not a lot of noise, it is more quiet and people there are very friendly. The climate, in fact, is generally very mild in Pisek because the town is surrounded by the Pisek Mountains and is thus protected from cold winds on all sides. This makes the area very conducive to outdoor activities in all seasons. Kovar decided early on that he wanted to be a goaltender. He came of organized playing age in the mid-90s, so one would have to consider that his idols would include countrymen who were established stars, like Dominik Hasek, Roman Turek or even former Flyer Roman Cechmanek, right? “Well, yes, I admired them all,” he explained. “But my favorite player is Martin Brodeur. He is the best player I have seen because he does everything right, and is a winner. My playing style is not like Brodeur’s, because in my home, we have a very unique style. I am more like Hasek in the way I play, but I always watch Brodeur and the things he does. A natural athlete and skater, Kovar moved quickly through the levels of youth hockey in his hometown area. Along the way, he continued to pick up on the intricacies of the goaltending position, and was a standout against other netminders his age. In 2004-05, at the age of 16, he posted respectable numbers (3.58 goals against average, .913 save percentage) in 40 games for IHC Pisek in the Czech Extraliga under-18 circuit. He moved up to the under-20 the following season, joining the famed Ceské Budejovice system. His stats were even better in 19 regular season appearances (2.23 goals against average, .926 save percentage) and five playoff contests (1.58, .948). Kovar got his first taste of international competition at the 2006 Under-18 World Juniors. He appeared in only two games in a backup role, but won them both, while posting more terrific numbers (1.14 goals against average, .964 save percentage). With his performance at that event, Kovar began to gain recognition as one of the top Czech goaltenders eligible for the 2006 NHL Entry Draft. Still, he did not appear on the Central Scouting Bureau’s final rankings report that year. He did, however, receive a glowing assessment from former NHL scout Kyle Woodlief of the Red Line Report, one of hockey’s most respected scouting publications. Several media outlets cited the report when the Flyers took Kovar with their seventh of 10 total picks that summer. Shortly after Kovar was drafted, there was some talk of the then-18-year-old making the jump to North America right away. Whether there was any actual intent or likelihood behind it, that chatter died down rather quickly and the netminder settled in toward his second season in the Czech equivalent to Canada’s major junior level. Kovar would take on the starting role for Ceské Budejovice’s Under-20 team with an even greater sense of confidence, now taking the ice as an official NHL prospect. Not surprisingly, Kovar turned in another strong season between the pipes for his team, recording a 2.07 goals against average and .907 save percentage in 38 games. His play earned him a spot on the Czech Republic’s national team for the World Junior Championships, where he served in a backup role to highly-touted Atlanta Thrashers prospect Ondrej Pavelec. Kovar appeared in two games, starting just one. The latter was the consolation game against Finland, during which he stopped 29 of 31 shots to earn a victory for the fifth-place Czechs. After the season, with another year in the U-20 Extraliga and his WJC debut behind him, Kovar made his decision to continue his junior career in North America official. Prior to this, he was projected to be promoted to the Extraliga, but former NHLer Turek and 23-year-old year old Jan Chabera were established with Ceské Budejovice’s, and blocked his path. Kovar was selected by the OHL’s Oshawa Generals with the 29th overall selection of the 2007 CHL Import Draft, and decided to make the jump across the Atlantic. 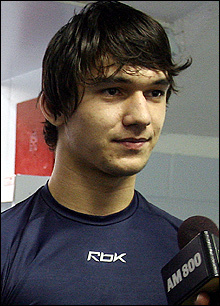 Prior to the start of the 2007-08 season, Kovar’s first in North America, the young netminder arrived in the Philadelphia area for his first rookie mini-camp with the Flyers. Who was most helpful to him at the camp? After the camp Kovar joined his new team in Oshawa, and began the next phase of his career. His transition to the North American game was relatively smooth, with a few bumps in the road and some expected growing pains along the way. In December, Kovar left the team to once again join the Czech national squad at the World Junior Championships, this time in his home country. Though he was projected by some to be the team’s starter, he was once again relegated to backup duty, this time behind good friend Michal Neuvirth. Neuvirth, a Washington Capitals prospect, had risen on the Czech depth chart when he led the Plymouth Whalers to the OHL championship the previous season. The result saw Kovar again appear in just two games. In a very ironic twist, Kovar and Neuvirth would be traded for each other just weeks after the tournament. Neuvirth was a member of the Windsor Spitfires, a young team looking to build to the future. He was sent to Oshawa in a big trade that saw Kovar go to Windsor. Windsor, a team that has struggled mightily to make the playoffs in recent seasons, is in its second year of new ownership, under a group headed by former NHLers Warren Rychel and Bob Boughner. Rychel serves as the team’s general manager, while Boughner also handles head coaching duties. The team, which had to endure the tragic death of its captain, Mickey Renaud, earlier this season, is looking ahead with a promising team for next year when it will also move into a brand new arena. The trade caught most observers off guard. Kovar, who had never been part of a trade to that point in his career, was also stunned by the move. So far, the move has worked out well for the Spitfires. Kovar has compiled a 7-3-1-1 record, 3.23 goals against average in 12 games with his new team. Windsor sits in second place in the OHL‘s West Division with a record of 33-15-6-4, and recently clinched a playoff berth. For now, Kovar’s attention is squarely focused on guiding the Spitfires into the playoffs. Once the postseason begins, he figures, anything can happen. “We can’t wait to get there and do our best,” he said. “We feel we can beat any team in a series, and I know I can pay well with pressure. I want to see how I can do in that situation. It is something I look forward to. Beyond the playoffs, it is looking more and more like Kovar will return to Windsor for at least one more season in the OHL. “Of course, I want to play in the NHL as soon as possible,” said Kovar. “I want to impress the Flyers and sign a contract so I can get started. But I like my time here in the OHL and [in Windsor]. This is a good thing for me. I would also like to play here next year to help my team win. Flyers general manager Paul Holmgren gave his own perspective on the situation. “Windsor’s a team that is looking towards building a real foundation for next year,” he said. “They think they’re a young team that can compete in their league next year so, that’s one of the reasons they made the trade [for Kovar]. They asked us what our plans were next year, if we would be looking to place him in junior and we had said that’s a good chance, but we’re absolutely happy with his progress.